Kissing 1 minute per day can slim you down, crazy ? A Russian newspaper quoted a scientific research saying that kissing can stablize heart artery behavior, prevent high blood pressure, reduce cholesterol, and in the long run can result in weight loss. No details given. The research also reported that during kissing, the massive saliva released in the mouth which is high in calcium and phosphorus can protect against tooth decay as well as reduce the probability of gum inflammation. I wonder who is cleaning who ? On the other hand, kissing is good for facial beauty as passionate kissing exercises 30 muscles on the face, promotes blood circulation, thus resulting in smoother skin. Is that how those skin beauty equipments were simulating ? Kissing relieve pain as the saliva contains pain relieving properties and the more passionate the kissing, the more saliva will be released. The researcher joked that if ever pain is unbearable, try kissing instead of pain killer medicine. Are the manufacturers of Panadol, Tylenol, Aspirin, etc. laughing away ? For those who buy in this research, please share the result. For those who are not taking the chance on kissing or weight loss pills, try tea. What is the point of having the best brain ? Every day, over 5 Singaporeans suffered heart attack (2,000 per year). 50% of them died when proper medical help cannot arrive on time. Shocking ? This is case of MC King, although the actual cause of his death resulting in “breathing difficulties” is awaiting the coroner’s report. Few days ago, a Chinese evening daily reported that a healthy fat Indian working in Singapore suffered breathing difficulties as he was riding on his motorcycle back to Johor Baru (Malaysian city across from Singapore) and died soon of heart failure. Heath Ledger, the Academy Award-nominated Australian actor is now suspected of dying from heart attack instead of drug overdose. No one will die from cancer instantly, but when the heart stops pumping, that can the end of it! So what is the point of just having the best brain? Heart disease is now the NUMBER 2 killer in Singapore, closing in cancer. In the USA & Europe, heart disease has already dethroned cancer as the #1 killer. According to the “State of Health 2001” report, it showed that heart disease accounts for 26.3% death; that is 1in 4 persons. In the USA, it is only 1 in 5. Scary huh ? If anyone has one or more of these major risk factors (identified by the World Heart Federation) which is associated with coronary heart disease and stroke such as smoking, alcohol consumption, high blood pressure (hypertension), high cholesterol, obesity, physical inactivity, unhealthy diets, he/she is likely to add to this statistics. According to the same report, 27.3% of Singaporeans are hypertensive; 58% are physically inactive during their leisure; and 24% are overweight, of whom about 6% are obese. That is 7 years ago, based on the modern increasingly “unhealthy” living and the deteriorating mother earth, what will be the statistics now ? Also known as the Dragon Fruit, the Pitaya is a stunningly beautiful fruit with an intense colour and shape, magnificent flowers and a delicious taste. The fruit, apart from being refreshing and tasty, contains a lot of water and minerals with many different nutrition ingredients. It tastes light sweet and it’s good for liver, laxative, supplementing fiber and very suitable for diet. Besides, dragon fruit is also good for person who has a high blood pressure. According to popular experience, obese person who has eaten dragon fruit regularly can reduce his/her weight naturally and have a beautiful balanced body but it does not influence on his/her health. Moreover, eating this fruit can stop and reduce diabetes. Hence, dragon fruit is a favorite fruit of many people especially Asian customers. They should be full-colored and free of moldy spots. Dragon Fruit should be refrigerated, unwashed, for up to 5 days. Serve chilled. Rolled out cookie dough into a 12 inch round. Meanwhile, prepare fruit by washing and slicing it into 1/4 inch slices. Cream together the cream cheese, powdered sugar and lemon juice. When the crust is cool, top with the cream cheese mixture. Lay fruit in a circle on top of the cream cheese mixture. Spread apricot glaze over fruit. Yesterday (9th September 2007), I read about the Singapore Health Promotion Board big ad in Sunday Times entitled “Bad fats come in many disguises”. It showed 4 of Singaporean’s favourite cravings that are unfortunately high in saturated and trans fat – poultry with skin (chicken drumstick), food with coconut milk (nasi lemak), pastries (looks like apple pie) and deep fried food (French fries). 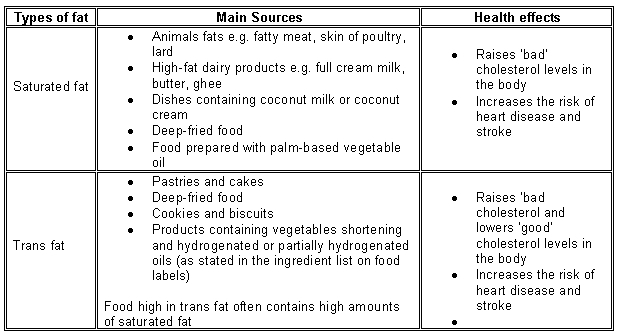 It also displayed a simple chart showing the main sources of the 2 fats and their adverse effects. It even came out with a “Spot the Fat and Win!” promotion where every week, a winner who SMS the code “6GR824” to 76868 will walk away with S$100 shopping voucher. Coming to the bad fats, other than eating fishes and vegetables, it looks like one got to do alot of detox to purge the bad fats and toxins from the body if one wants to indulge in those mouth-watering delicacies. WANT TO REDUCE WEIGHT? PLAY SOCCER Sports scientist Peter Krustrup and his colleagues from the University of Copenhagen, the Copenhagen University Hospital and Bispebjerg Hospital did a research which showed that playing soccer is healthier, burn more fat and more fun than jogging. For a period of 12 weeks, a group of soccer players and joggers have been active for one hour 2-3 times a week. The participants have been continuingly subjected to tests: fitness rating, percentage of body fat, total mass of muscles, cholesterol, blood pressure, insulin sensitivity and balance. * Joggers – lost 2 kilos of fat, no change in total muscle mass. Although both groups moved at the same average speed, soccer is more fun than jogging because jogging focuses on oneself, which led to the joggers noticing their efforts and the breathlessness and can lead to them feeling sorry for themselves. Soccer players forget it is hard because all contributed to the effort as they focus on the game and don’t notice that their hearts are pounding. Therefore, to fight obesity and inactivity, soccer seems to be an obvious alternative to jogging and fitness. Forget the hype about single antioxidants, like vitamin E or beta carotene. They’ve never lived up to the promise that they can halt heart disease, cure cancer, eradicate eye disease, or prevent Alzheimer’s. But that doesn’t mean antioxidants aren’t important to your health. The notion that antioxidants are good for you comes from studies showing that people who eat foods rich in a variety of antioxidants have better long-term health. Trials of single supplements, usually taken in pill form, have yielded disappointing results. Antioxidants stabilize harmful by-products of the body’s energy-making machinery. These by-products, known as free radicals, can damage DNA, make LDL (“bad”) cholesterol even worse, and wreak havoc elsewhere in the body. It’s possible that single antioxidants haven’t panned out because it takes a network of antioxidants — like those that exist in foods — to neutralize free radicals. If that’s the case, then it would be helpful to know the antioxidant content of various foods. An international team of researchers did just that for more than a thousand foods that Americans commonly eat. Topping the list for antioxidant content were blackberries, walnuts, strawberries, artichokes, cranberries, coffee, raspberries, pecans, blueberries, and ground cloves (see “Antioxidant-rich foods”). Here are the three dozen foods with the highest per-serving content of antioxidants. Cooking appears to increase the antioxidant potential of most foods, with the exception of grains such as rice, pasta, and corn grits, which show lower levels after cooking. The researchers were careful not to claim that eating foods at the top of the list will keep you healthy. Instead, they believe that rating the antioxidant potential of different foods could help test whether antioxidants really do prevent disease. In the meantime, the list toppers are healthy foods, so don’t hesitate to dig in. For more information on antioxidant-rich foods, order our Special Health Report, The Benefits and Risks of Vitamins and Minerals, at www.health.harvard.edu/VM.